“Hitler did not set foot in the extreme right wing camp until he had been rejected by left wing groups.” — Lothar Machtan. The ink wasn’t dry on the Versailles Peace Treaty before the Illuminati started work on World War Two by building up Adolf Hitler and the Nazi Party. Before 1919, Hitler had been a political “gun for hire” who had many Jewish friends and had flirted with both Communism and Socialism. Overnight he became a virulent anti-Communist and anti-Semite. What happened? I suspect General Kurt Von Schleicher was the point man for Illuminati bankers like German Intelligence Chief Max Warburg, left, whose Frankfurt I.G. Farben HQ was spared by Allied bombers, and whose Jewish mother lived in comfort in Hamburg throughout the war. Von Schleicher, who was briefly German Chancellor, was murdered during the 1934 purge because he knew too much. Dr. E. J. Dillon of the London Daily Telegraph wrote in his book “The Inside Story of the Peace Conference,” (1920): Many delegates deduced that “henceforth the world will be governed by the Anglo-Saxon people, who in turn are swayed by their Jewish elements…” (i.e. the central bankers and their factotums) p 497. Hitler didn’t come to power until 1933 but Germany started rearming in 1919 in contravention of Versailles provisions. The Allies turned a blind eye to a program that saw Communist and German soldiers train in Russia with the latest weaponry, including whole bases devoted to air force, armor and chemical warfare. When Hitler came to power in 1933, Germany already had an advanced air force. Another way to evade Versailles was for the Reichswehr to fund and train paramilitary organizations like the Nazi SA which later could be incorporated into the regular army. General Kurt Von Schleicher and Captains Karl Mayr and Ernst Roehm were in charge of this “Black Werhmacht” program. The Reichwehr’s purpose was to create popular political support for WW2. According to Delmer, “Schleicher paid out no less than two million pounds from the Reichswehr’s secret funds for the Nazi storm troopers…” (120) They were also funded by Illuminati industrialists and bankers. Communism, Nazism and Zionism are triplets, movements conceived and nurtured by the Illuminati to dupe and manipulate humanity. This book asserts that Hitler was an active homosexual with a thick police file of molestation complaints both in Vienna and Munich. In the Controversy of Zion, Douglas Reed writes that Hitler was taken prisoner in 1919 as a Communist serving an emissary from Moscow. Hitler described himself as “the executor of Marxism” at the time and modelled the Nazis on the Communists. He wanted to call the Nazis the “Socialist Revolutionary Party.” Reed who met Hitler and studied him at close quarters wrote in 1955 that the truth about Hitler has not yet been written. p. 395. There, in black and white, is the blueprint behind the NWO, UN, the EU and NAU, and every war until today. But the bankers have made us think it “racist” to pay heed. 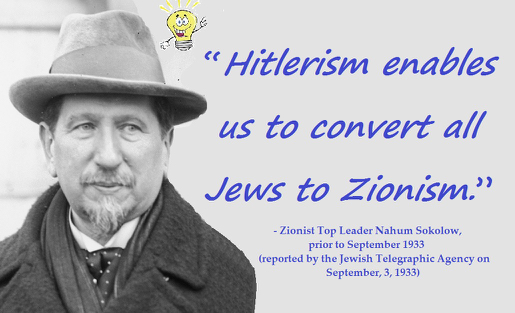 As if more than 10% of Jews were/are a conscious part of their heinous, diabolical conspiracy. Modern history consists of this long-term plan to foment needless wars in order to enslave mankind by destroying nation, religion, race and family. Most historians are paid to obscure the horrible fact that the people ultimately responsible for Auschwitz, the Gulag, Hiroshima and Verdun, still run the world. They are responsible for 9-11, Afghanistan, Iraq and Syria. There is nostalgia for Hitler, in the belief that he represented resistance to the New World Order. 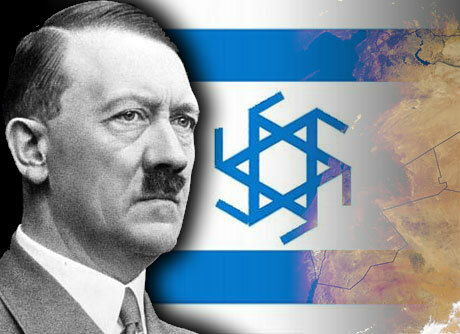 In fact, he was created by the Illuminati to start another war, kill millions of goyim, discredit anti Semitism, race and nationalism, and provide a rationale for Israel. Major Robert H. Williams reported in his “Williams Intelligence Summary” for February 1950 about James P. Warburg’s part in the plot against Christendom. He said: “Last November, the widow of the late General Ludendorff, on trial at Nuremberg, explained why her husband broke with Hiter, confirmed the reports in convincing detail.